I left San Ignacio at 11am (it was cloudy, so there was no rush to avoid the midday sun), and though hilly, it only took 40 minutes to reach the Guatemalan border. The Xunantunich ruins are located halfway to the border, by crossing this river, but I skipped it. There are more impressive ones in Guatemala! I had 95 Belizean Dollars left to exchange, and by searching online, I had found that they were worth 345.5 Guatemalan Quetzales. I also found comments saying that haggling for a 5% fee would be doable, so I was set to get 328 Quetzales for my 95 Belizeans. But nope. When asking around outside the immigration building, they all offered only 285 and not a dime more. So much money lost! I stood there for a while, not sure what to do, but decided to not let them get their way. I went through the immigration fast and easy (It costs 40 Belizean Dollars to exit, no charge for entering Guatemala), and a guy on the other side offered 300 for my 95. Still not a great deal, but at least it was better, so I accepted. Pro-tip: Avoid changing money at borders, just plan ahead and use up what you have! And have a credit card with you. Credit cards are good. A river between Belize and Guatemala. 1. As usual, the Western Union locator website is way off, and it took a while to find the office in the town. 2. I needed two phone numbers from Guatemalan contacts since it’s my first time withdrawing in Guatemala. And I had no numbers at all! Luckily there’s a plaza with free WiFi nearby, and I managed to get a few numbers from Couchsurfing.com contacts. It’s good to make online friends! 3. They were extremely picky, and I had to sit in their freezing office for more than half an hour while they were tapping away on their computers. They asked me to write my signature twice, and compared them carefully to the signature in my passport! So suspicious, for the value of 60 USD! Finally I got my money, and I went back to the the “plaza” (an unusual one because it’s actually inside a building), and ordered a nachos and quesadilla combo for 15 Quetzales (about 2 USD) to calm my screaming stomach. Because I was starving. Lots of food, though not much vegetables included, just a few squares of tomato. Bought some water and juice (6 Quetzales!) at the supermarket, got my tires re-pumped for free at a bike repair shop again, and got going around 2:30pm. This first Guatemalan part might have been my favorite so far! The roads are finally nice again, and there’s so much beautiful scenery and life. Occasionally it reminded me of a Legend of Zelda game, with little houses on the hills, women washing clothes in the lake, pigs, cows, horses and chickens running around along the road. Very idyllic! After 20-30 kilometers came the greatest physical challenge so far. A loooong steep hill. I admit I had to start walking after a while, especially because my lowest gear is not working. I need to fix that when I get the chance. After walking uphill forever, sweating and breathing heavily, I finally got up and sat up on my bike. Only to see that another equally steep hill came right after the first. For no reason, the nice road turned into dirt road! Let’s just say I got very muddy. I had to bike very slowly, but after a kilometer or so, proper road came back again. After that, it was mostly downhill, but the uphills were slowly killing me. A particularly big hill (surely not that impressive compared to other hills in the world) with 10 km to go made scream out an “ARRGH” as my last bits of energy was consumed. I had expected to arrive by maybe 5pm, but once again, the sun went down on me, and it got very dark. To be fair though, the sun sets very early here, before 7pm. Sunset over lake Petén Itzá. I biked through the tiny village, but as I got closer to where my hostel should be, it got near pitch black again! I wasn’t sure if I had gone the wrong way or what was up. In the darkness I saw what seemed like candle lights and a human, and I asked where Doña Tonita is. “Right here,” he replied! Turns out they had a black out, and I was lucky to have found it at all! Candle lights lighting up the stairs to the bathroom. So far (I’m still in darkness though), I really like the place! It’s only 50 Quetzales per night, and the dorm is above the restaurant, just a straw roof and open sizes. The beds are big queen sized beds equipped with mosquito nets. I watched the latest Game of Thrones episodes and went to bed at 10pm, unable to update the blog or tell anyone I’m alive. I hope you weren’t worrying too much!! I suddenly realized that my fancy Playa del Carmen baseball cap is gone! I had put it in the bike basket when I arrived to the town, and it must have fallen out. The road from the Mexican border to the closest Belizean town, Corozal, is narrower than the ones I had biked on in Mexico. There was barely any room for me if cars met, so I felt a bit in the way when cars occasionally had to slow down. It was a windy but short ride, and I arrived within 30 minutes. It’s hard to pinpoint what it is, but coming to Belize feels like being in a completely new country! That might sound silly, because it obviously is a new country, but normally when crossing borders by land, the difference doesn’t feel as big, at least in Latin America. But here, they speak funny English, they look different and have darker skin, and the prices are twice compared to the Mexican east coast, even though it’s at least as simple and dirty, at least in this village. Worse roads too. I had to stop and pump the tire on the ride to Corazal, so something is definitely fishy. As I was biking through the town, I saw a bike shop and asked if they could pump my tire, and the friendly and chill dude (I imagine Jamaicans to be like this, though I haven’t been there, yet) said no prob! When I explained the situation, he said “must be a tiiiny little hole!” and the way he said it was just hilarious! He said he’d fix it for 2 Belizeans (≈1 USD), so I’ll definitely go back later. He didn’t want money for pumping my tire. Since my credit card is gone, I had checked online to see that three stores in Corozal deals with Western Union, and as I arrived, I immediately saw “Fry Store” along the road, which was one of them. “This was easy,” I thought. But of course it wouldn’t be easy. They had stopped offering WU services. Two more places to try… Would I have to stay the night hungry on a park bench? The locations map on Western Union’s own website turned out to be very inaccurate, so I kept asking people and biked around the entire town, also looking for the cheapest hostel. Then suddenly I found Doony’s Instant Loan, far from where I had pinned the address on my phone. And success, they are still WU certified! Would it be that easy? Well no. Just showing my passport wasn’t enough; I also needed a long MTCN code, and I didn’t have it. The lady said I could get free WiFi in the park nearby, so I went biking once again. The park turned out to have great WiFi, but only for 1 hour per day! Luckily it was enough for me to find the code, and I returned and got my very first 117.5 Belizean Dollars! I’m rich! Turns out there are no hostels here, only private rooms in hotels. By now, I had asked around for prices, and for 45 Belizean dollars per night, The Sea Breeze Hotel was the cheapest option. It’s a nice place right next to the Caribbean Sea. Good showers, free drinking water, air-conditioning if you pay extra. The next morning I asked for a place to buy groceries, but the owner said she’ll make breakfast for me! I can only assume this is a typical Belizean dish. Tortillas, beans, fried eggs with tomato and cheese on top. It was pretty good! Fresh papaya juice too! In the evening I went out to find something affordable to eat, but was surprised by the costs. A pizza seems to go for 20-30 Belizean dollars!! A small burger for 10. Are people actually rich here, but just dress and live very simple?! I’m confused by this country. The supermarkets are similarly expensive, with a bag of potato chips being sold for 12-14 Belizeans, a tiny bag of nuts for 6. The only affordable thing I could find were bananas, sold by a woman on the street. 8 bananas for 1 Belizean is nuts! At Perfecto Restaurant near the park, the most affordable meal was chicken sweet & sour for 10 Belizeans. It was alright, and definitely filling! Before leaving Corozal, I went back to the bike repair shop (also near the park) to fix my tire once and for all. Turns out it had four tiny holes! He said that in this heat, patching so many holes will not work, and that I’ll get a new tube for 5 Belizeans. I agreed. 7 Belizeans (≈3.5 USD) for the whole reparation would have to be worth it. The bike repair guy was a cool dude. Now I was ready to continue my journey! 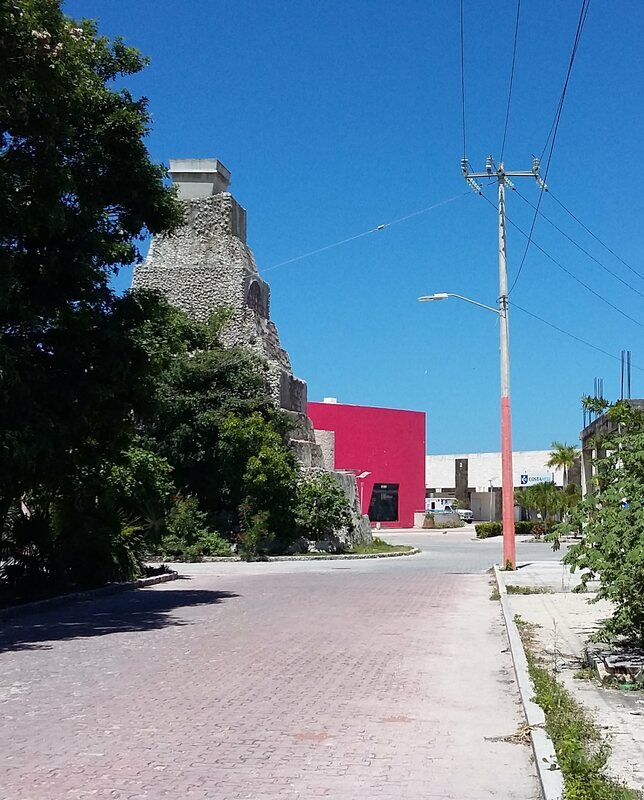 Today I biked to the neighboring village Costa Maya to withdraw money with my friend’s credit card, because Mahahual has no ATM. It was a short but sweet ride. The best news is that I had the wind at my back, and it was so much nicer to bike this way! Tomorrow I’m biking back from the coast, and I’m hopeful that it will be a much more pleasant ride without constantly struggling against the wind. Costa Maya was an odd experience. I’m pretty sure someone thought “hey, let’s make this the next super tourist resort!”, but something has gone wrong. All the buildings had “for sale” signs, and it was like a complete ghost town. You could wonder why this of all places had an ATM, but there is ONE place that is alive; a big 4 star hotel named Costa Maya Inn that seems completely out of place. It was a nice little trip, and I got to add 6 km to my totals. Except for just relaxing on the beach, reading, writing, one may also do some snorkeling! For 250 pesos, you’re taken out to sea, you get fins, snorkel and mask and get to swim a certain distance with a guide. In this case, he was a super enthusiastic Mexican-American hotel manager named Marcelo, who needed a change and was now swimming with tourists instead. I think either you’d love him, or you’d find him to be “too much”. Whatever your preference is, he’s certainly a character. I had not done much snorkeling before, but it was alright! A little grey at times, but very clear sight, as I saw the bottom at a 20 meter depth. Occasionally there were corals with lots of fish of all sizes, which was cool, and the highlight was swimming right next to a huge green turtle (one meter long surely), and it felt like something right out of Finding Nemo. My two favorite restaurants in Mahahual are Loncheria El Primo and El Salsero Mayor, both on the main street, Huauchinango. 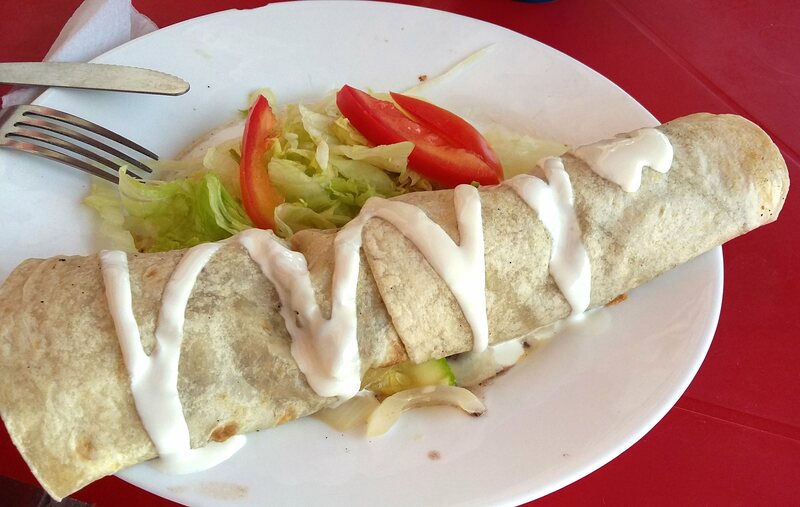 The former has this super tasty burrito (left food pic) for 45 pesos, tacos for only 10 pesos, and a whole liter of fruit juice for 30 pesos. The latter has a lot of variation, and it’s all less than 70 pesos per meal. 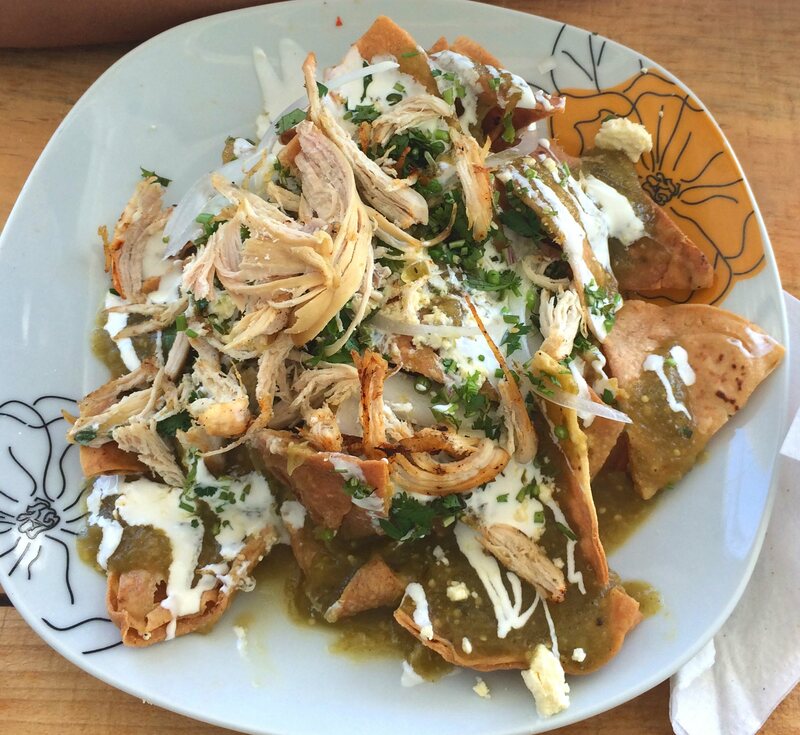 In the middle, we have chilaquiles; some kind of nachos covered by sauces and more. On the right, gringas; wheat tortillas with a bunch of ingredients. 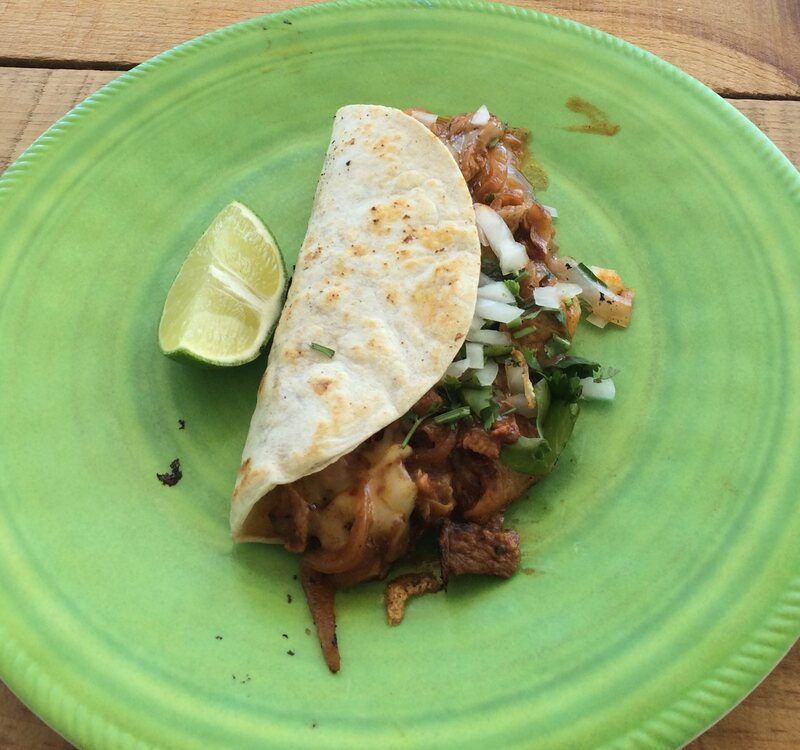 You could say they are like tacos, but bigger and more filling. I’ve also tried enchiladas (almost pancakey tortilla rolls covered by sauces) and burgers there. Now I have enough Mexican pesos for my last few days here, but I will need a good amount of Belizean dollars upon arrival in the new country. So I tried using Western Union, sending 500 SEK + the fee of 25 SEK (a total of around 65 USD). For this, I get to withdraw 117 Belizean dollars at any shop that deals with Western Union. There are three in Corazal; the city closest to the Mexican border. I compared the currency conversion at XE.com, and learnt that 525 SEK is currently worth 129 BZD, so it’s not too bad! I lose 6 USD on a 65 USD transfer, which seems similar to the fees and conversion fees when using regular ATM’s. I’ll tell you next week if I managed to withdraw those Belizean dollars or not!